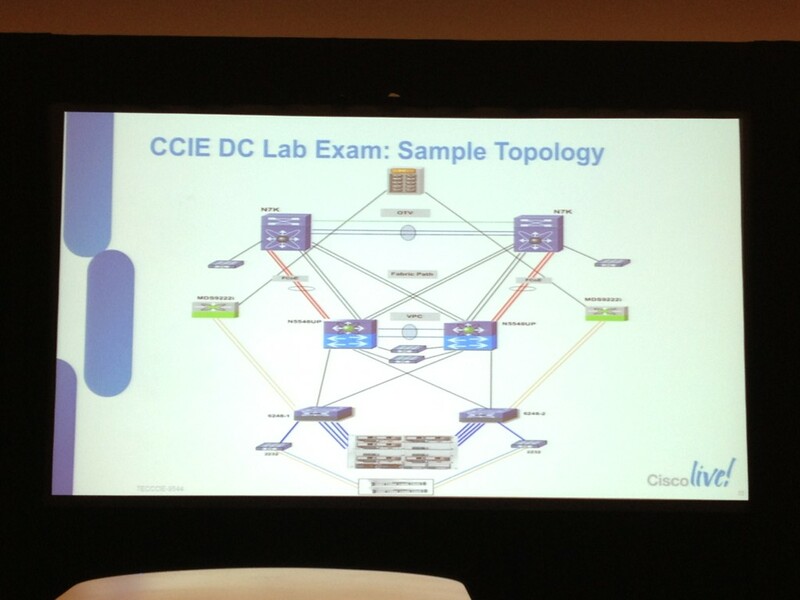 The CCIE Datacenter techtorial was a very good session giving a good overview about the contents of the exam. I will not focus on the technologies in this article, but only on the specifics that I wrote down during the session. This means you will only find details about the exam and not about the technologies. There are enough resources to find details about the technologies, but you are reading this article if you want to know what to find when you step into the testing center or the lab. The session was presented by 3 guys, I would specifically mention Walid Issa who is the product manager for this particular CCIE track. Walid is a very nice guy and if you want to know something about the lab, ask him! Over 200 took the written beta already. it’s expected that a lot more people will take the DC written beta during Cisco live San Diego. The Written is an overview of technologies with a medium to hard level. As all other written exams for CCIE the focus is on theory and not on configuration. When you know the technologies you should be able to pass. You will NOT be tested on any other things than Cisco. So the Nexus 1000V will be pre-installed and ready within VMware. Storage and ANS (ACE appliance) are not that big topics, just a few points, not that complex. The focus is on NX-OS networking, UCS deployment and Nexus 1000V! The exam consists of only 1 section of 8 hours. Do expect troubleshooting! Things will be broken when you come into the lab. The lab is designed to guide you through a ‘standard’ Datacenter installation. So you will be building up an entire Datacenter. The setup is based on 2 sites! There is only hardware for 1 physical site, therefore various virtualization technologies are used to define 2 sites that you need to interconnect using things like OTV. From the start there will be a physical lab in Brussels and San Jose. So you do not have a remote desktop with latency or other problems. Your equipment is locally available on the site. You will be tested on FCIP and iSCSI on MDS as an IPS module is integrated. Be prepared for FCoE (multi-hop) with a target connected on 7k requiring FCoE through n5k up to native FC to the UCS. Native FC is also available and used! FCIP is used as Datacenter interconnect between the 2 sites. Only port profile and uplink configuration on nexus 1000V, everything is installed already. Static port pinning is a topic! 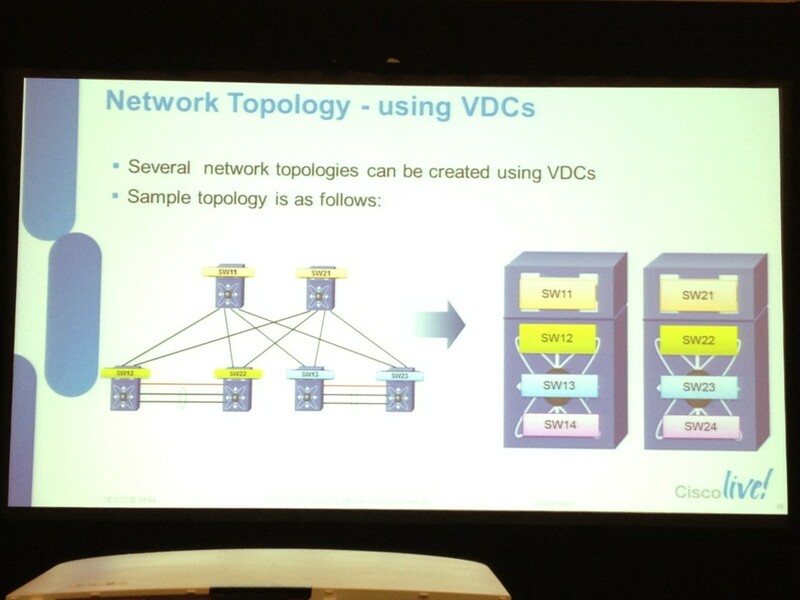 Fabric interconnect with VE port uplink coming this fall in Delmar release, this is not tested in the lab! Know the difference between storage VDC and VDC with native FC! Do not change any pre-configuration!! As for preparation you can use the UCS emulator to test UCSM configurations, e aware that this is gen1 hardware being emulated, while the lab is using gen 2 hardware. Cisco is looking into offering rack rentals and preparation materials, but no confirmation can be given about what is developed and when it’s released. By the end of fall 2012 a CCIE Datacenter preparation book will be released by Mike Frase (Support Engineer), which will bring you up to speed about all topics on the blueprint. If you still have some question, reply on this article or post in the Facebook CCIE Datacenter group and I will mostly be able to answer your question. The FCoE storage is directly connected to the Nexus 7k. Traffic goes over FCoE ISL to the n5k and then with native FC towards the fabric interconnects. I don’t know about the code, there are some improvements in 6.0 that they might want to test on. I’m not up to date about all detailed differences. Understood, but I am not sure if it will be tested in exam, because if multihop FCoE is to be tested they have do something like this. Since there is no FCoE attached storage in lab equipment list then it is not very clear how they can test Multihop FCoE. Like I mentioned in the comment, there is an FCoE target connected to the nexus 7k. It’s not on the equipment list, but you don’t have to configure it either way. It’s just a FCoE interface, so you should know how to configure that. During the techtorial I saw a slide when the FCoE target was connected, it’s just not on this particular sample drawing. Do you have the pdf for the session ? If yes do you mind sharing it ? Can you elaborate on “•Do not change any pre-configuration! !” please? Naturally configuration will be changed during the lab very significantly – so which configuration exactly is recommended not to be changed? Are you able to elaborate on the ACE portion a little more as well? (However little it may be). I have read this publish and if I could I wish to recommend you few interesting things or advice. Hello, I’m Reuben and I’ve recently begun to get into what you’re referring to. I don’t know where you’re finding your details, but great job anyway. I really should invest some more time learning and understanding much more.